MG Bevan was a prolific batsman who became known for his skills in finishing off an innings and providing handy variety with his left arm wrist spinners. His record in ODI cricket with the bat was outstanding scoring just under 7000 runs and averaging over 50. He churned out the runs with regular monotony in First Class and Domestic One Day cricket scoring 68 First Class hundreds and averaging over 57. For students of the game, The best of Bevan provides a window into the processes behind the success of MG Bevan as he recalls a selection of 30 games that shaped his career. Contained is wisdom gleaned from playing all around the world and being presented with many challenges to overcome. The highlight for most readers would be his account of the famous last ball victory in the ODI played on January 1, 1996 at the SCG between Australia and the West Indies. This was a game where Bevan’s ability to execute his skills in a high pressure situation were on display for all to see. Students of domestic cricket will appreciate references to the Nat West Trophy Quarter Final between Yorkshire and Lancashire in 1995 as well as recounts of Sheffield Shield games and the Mercantile Mutual Cup Final played between NSW and WA at the WACA in 2001. Another thing we love about The best of Bevan is the fact it is not your classic autobiography. It is a book that you could pick up and read any chapter in any order at any time. It confronts the challenges as well as the highlights of MG Bevan’s career and provides helpful insights on the art of batting. For those looking to include reading into your busy schedule, The best of Bevan is one to add to your reading list for 2019. Cricket librarians all around the world would agree that a high quality audio visual section will enhance the library experience for librarians and borrowers alike. In years past, access to VHS tapes, DVDs, Compact Discs and Cassettes were sufficient to meet the basic requirements of an audio visual section. These days however with technology moving at a rapid rate, the influx of audio books has opened a whole new world for those wishing to expand their horizons. Modern technology has enabled librarians and private citizens alike the opportunity to listen to a wealth of cricket related material through devices such as MP3 players, mobile telephones, tablets and computers. This creates endless possibilities for those who are looking to expand their libraries but do not have the budget to undertake extensions. Adding electronic files to your favourite device ensures you can essentially listen to your favourite cricket book anywhere at any time. Some people may feel that embracing audio books may come at the expense of reading the printed material that we have all loved for so long. However, we prefer to see audio books as a welcome addition to expand your capacity to consume cricketing material. Some astute librarians will listen to the audio version whilst following on in a hard copy of the text. In addition, for the safety conscious, reading and walking has traditionally been off limits, now this can be done with consummate ease and increased safety which would be music to the ears of those WH&S representatives reading this. There are certainly many more benefits to audio books that have not been included in this article that you are sure to discover for yourselves as you expose yourself to emerging technologies like this. We would encourage you to incorporate listening to audio books in your daily routine in addition to the regular reading of cricket books as we are convinced you will not be disappointed! In the rapidly changing world we live in and the increasingly demanding schedules that people have, it can be a challenge ensuring there is space in our day for reading cricket books. As cricket librarians, we are in the privileged position of having access to a plethora of reading material at our finger tips. Prioritising time to read though is paramount in ensuring we can provide timely and relevant advice to our community of readers. With this in mind here are some proven strategies for ensuring you find time to read. Having someone in your life that you can trust with the responsibility of asking you about what you have been reading is a helpful motivator for some readers. Give people permission to ask you on a daily basis what you have been reading and how it has inspired you. You will find that once you have formed the habit of reading, the frequency of having others ask you about your reading can be reduced dramatically. Social Media and screen time in general is often detrimental to time management and overall productivity. However, if there is one positive we have found with social media it is the social capital that can be derived from posting highly engaging content with your networks. When you commit to reading and sharing what you have been reading on the various social platforms, people will start to perceive you as someone who is refined, disciplined and resourceful. It will also have the two fold effect of encouraging others to put their device down and dedicate some time to reading. Having cricket books in strategic locations around the house can provide helpful visual reminders that reading is a priority. We have heard unconfirmed reports that some people have been known to keep books in the refrigerator to help stimulate a hunger for reading cricket literature. This is one of the coolest suggestions we have heard and would love to hear from anyone who has found this method beneficial. Riding a stationary exercise bike is a fantastic way to keep fit and healthy. When you next go to your local gym, instead of watching the cricket highlights while you exercise, we would recommend that you mix things up by bringing some reading material with you. This does not always need to be a cricket book as we have previously advocated reading cricket magazines is also OK. Combining exercise and reading is a helpful way to ensure your physical fitness is not neglected and your mind is stimulated. Alfresco reading is a very popular phenomenon amongst our community of readers. There is something refreshing for the soul when you sit in a quiet spot outside and turn the pages of your favourite cricket book. Obviously, if you do decide to read alfresco, ensuring you are hydrated and have the appropriate sun protection will ensure the quality of the experience will be maximised. We trust this non exhaustive list of suggestions will provide you with a starting point to reinvigorate your passion for reading and inspire others to do the same. Cricket librarians all around the world would confess that reading magazines can be very enjoyable. Although it is rare for them to admit this publicly, our sources can confirm that it is not uncommon for cricket librarians to have many volumes of reading material in this format amongst their private collections of cricketing literature. Magazines have the appeal of containing shorter more condensed articles that can be read in a matter of minutes. In today’s world of rushing from one appointment to the next, magazines can provide the perfect opportunity to read on the run. These publications provide readers with a vast array of contributors who bring their own unique flavour to the text. If there is a particular author that does not resonate with you, it is ok to shoulder arms and turn to something that is more to your liking. The icing on the cake however, particularly for younger readers and the young at heart, magazines often contain a pull out poster that can be displayed in your home cricket library. Imagine the boost this could be to an emerging book monitor’s social capital, when guests visit to see these displayed in and around the book shelves. Although this is a topic that some would find confronting and possibly controversial, we think it is important to reaffirm to our community that it is OK to read cricket magazines. TJ Zoehrer had the distinction of representing Australia in 10 Test Matches and 22 One Day Internationals. He was an accomplished gloveman and respectable batsman who scored over 5000 First Class runs. Zoehrer’s leg spinners were also more than handy providing another string to his bow. Readers of cricketing literature rejoiced in 1995, when Zoehrer put pen to paper and told all in a compelling account of his career in the hard hitting autobiography, The Gloves Are Off. To quote the front cover of the text, it was at that point in time “Cricket’s most explosive expose”. Cricket librarians around the world stocked their shelves with this one, knowing that astute readers would want to know just what went on behind closed doors during Zoehrer’s tenure in the Baggy Green. There was also an appetite for insights of his final years playing for WA and the political climate at the WACA at the time. Was their a feud with RB Simpson and if there was, what was at the source of the tension? What really happened at the end of the tied Test Match in India? How did he feel about the appointment of WA’s captain in 1994? These questions and many more were finally put to bed in this compelling tell all autobiography. As well as this we get a deeper understanding of Zoehrer the man and his convictions. For young book monitors and those making their way as librarians, it is strongly recommended that you acquaint yourself with the man affectionately known as ‘Ziggy’. Having an appreciation for his story will put you in good stead for your career and give a general boost to your social capital. 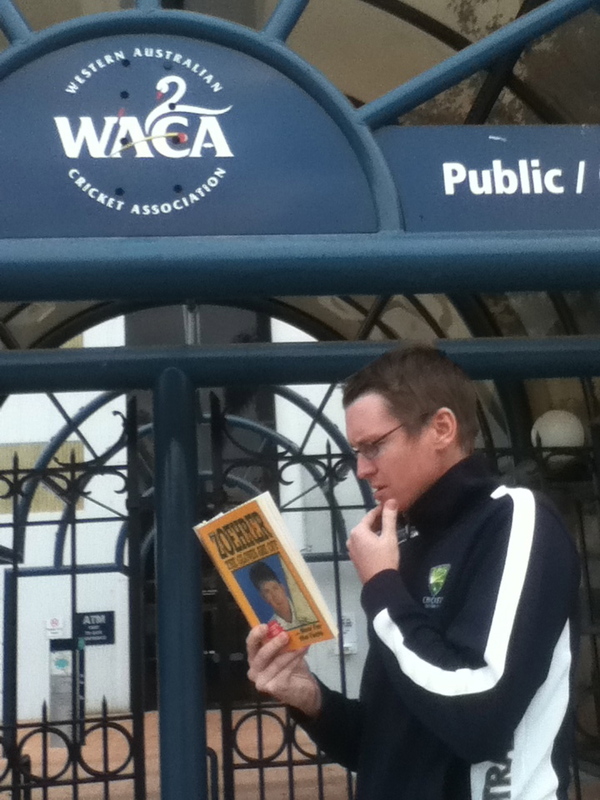 When it comes to reading this one, our librarians unanimously agree that making a trip to the WACA Ground in Perth is the best way to fully immerse yourself fully in the text. Immerse yourself in the text by reading it at the WACA. Prior to the explosion of the digital age, hand drawn graphs such as this were the focus of many water cooler conversations in the workplace. If you are reading this article, I am certain you are someone who is an astute individual with a desire to elevate your cricket knowledge to higher planes of excellence. As students of the game, we are prone to having a sometimes obsessive interest in cricket statistics. With the explosion of the digital age and the connectivity we now have with social media, it is inevitable that access to cricket statistics has become more readily available. It is no surprise that we have all spent countless hours perusing scorecards of obscure fixtures to try and glean an insight into the statistical trends of players past and present. Before you know it, it is often four a.m. and you realise that although you need to leave for work in a couple of hours, the adrenaline rush of being engrossed in the stats has you far too alert to get some shut eye. With this in mind, as a service to our valued community of readers, we are going to share some insight as to what some of our librarians have found a positive way of channeling their excessive energy at these times. 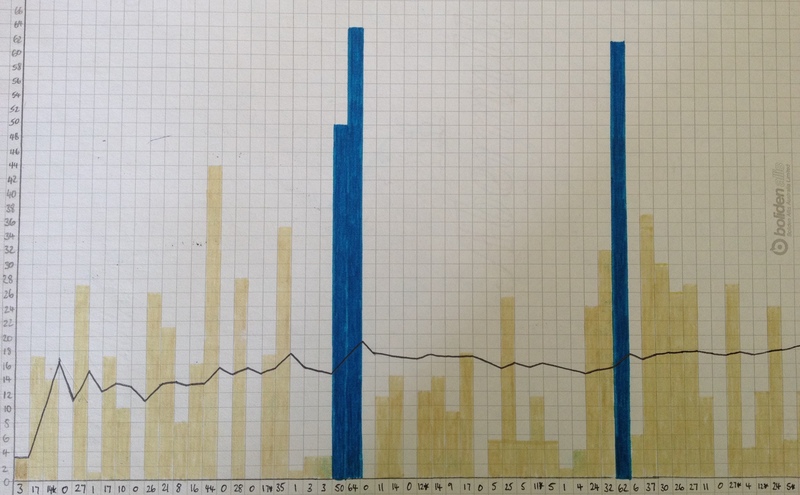 The humble “Manhattan Graph” or “Column Graph” as it is more widely known in classrooms around the world is our suggestion for putting your positive energy to work. It may not sound glamorous but neither is swimming laps of a pool at 4a.m. for a budding Olympian. The rewards however, are obvious to all. When you produce a document that you can pull out of your briefcase at a moment’s notice to startle your colleagues, your social capital will sky rocket. This often leads to work promotions, invitations to dinner parties and countless friend requests on Facebook as well as numerous additional followers on Instagram and Twitter. Better still would be the pinnacle of all compliments, when someone takes a snap of your work and pins it on Pinterest. It is ok to have big dreams! In the rare event that your work is not appreciated, you still have the obvious satisfaction of possessing a document that you can be personally proud of and have as a ready reference if you run out of data or there are issues with internet connectivity. It is time to stop reading now, grab your grid paper and make the next step towards personal excellence. We look forward to seeing the fruits of your work! This week on Rhema FM in Newcastle, Shayne Holstein caught up with Matt Ellis to wrap up the historic Day Night test Match as well as the WNCL Final played between the Breezair SA Scorpions and the Lendlease Breakers from NSW. As well as this we look at the leading performers in both the Test Series and WNCL competition. Grace Harris was outstanding for QLD in their victory over WA on Sunday but it wasn’t enough to propel the Fire into the WNCL Final. South Australia were too good for Tasmania with Tahlia McGrath impressing with the willow for the Scorpions. NSW were at their dominant best ensuring they finished top of the ladder after an impressive ten wicket victory over the Vic Spirit. With the Final of the WNCL coming up next weekend between the Lend Lease Breakers and the Breezair SA Scorpions we take a look at the matches played last Saturday. South Australia were up against QLD, Tasmania took on WA and NSW did battle with the ACT. Have a listen to how it all panned out in another exciting round of the WNCL competition.